If you attend CES just for a number of years, you'll quickly see just how difficult it is to establish a successful high-end audio company. In this sea of competing companies, many names fall by the wayside each year. After 78 years, it is truly amazing to realize that Tannoy is still in the audio biz! Founded in 1926 by Guy R. Fountain [right], Tannoy can rightly claim to be one of the companies that invented high-end audio or high fidelity as it was then called. A large part of their longevity surely lies in the fact that they have sold, and continue to sell, much of their product into the professional audio market. It was in those professional studios that audiophiles first began to recognize the high quality of Tannoy monitors. Tannoy eventually responded with speakers designed in cabinets more suitable for the home. ohms. The model series progressed through the Black, Silver, Red and Gold Monitor series, recognizable by the respective color of the magnet cover. The Tannoy Dual Concentric is still considered to be one of the most sophisticated and well-engineered driver designs ever made. Given its high efficiency (greater than 92 dB) and wonderful sound qualities, it's no wonder that a determined DIY/tube underground has set out to improve upon the vintage sound through better cabinet design. Take a look at this Dutch website to get an idea of these efforts. 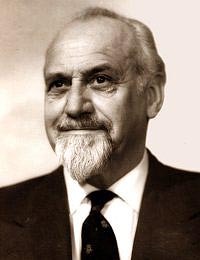 My first exposure to Tannoy was in 1988, at the home of friend Arthur Loesch who had the 15" Gold Monitors in Tannoy's Stuart enclosures. While I was mightily impressed with the coherence, dynamics, tonality and overall majesty of the sound, it was also not hard to hear a certain level of darkness and wooliness in the bass that could be distracting over long-term listening. In the years hence, I have heard the following Tannoy speakers: Corner York, Arden, IIILZ, GRF and Westminster Royal. It is my personal observation that this bass quality is something of a Tannoy house sound. With further listening and networking, Arthur felt that the 10" Tannoy Monitors avoided this bass quality while at the same time exhibiting a greater openness in the midrange. The quest then began to obtain the Tannoy Cornetta cabinet which employs the 10" Monitor Red in a rear horn-loaded design. This cabinet design was so short-lived that even Tannoy is unable to provide any information due to the destruction of relevant files in a fire some years ago. There also is no useful information on the Internet about the Cornetta. I emailed an overseas acquaintance of mine who has probably sold more vintage Tannoy than most anyone else. He had never heard of it either but procured a copy of a 1976 Japanese magazine article for a Cornetta cabinet from one of his Japanese customers. 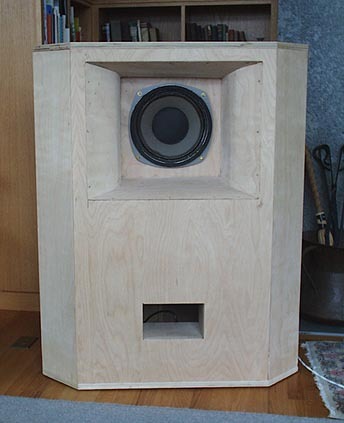 This cabinet plan turned out to be much different than the original Tannoy Cornetta design, being a corner cabinet of hybrid front-horn/bass reflex design. I was somewhat disappointed to not have unearthed the authentic Tannoy cabinet and put my pair of 10" Gold Monitors aside to focus on other vintage lust objects (e.g. putting together a matching pair of Jensen Imperials). I then had so many other projects going on that I decided to sell the 10" Golds plus the cabinet plans to a friend who used to be a cabinet maker. Not being a hardened audiophile, he didn't overanalyze the non-authenticity issue and just set out to build the cabinets as per the blueprints. He converted the metric measurements into inches and a Japanese friend of mine translated the important instructions. The cabinets were built from 3/4" Birch plywood, with the front horn formed by cuffing the back, wetting the wood and slowly bending it into shape. This is not an easy task for an amateur woodworker. Alas, he happily agreed to lend them to me for this article. I believe this to be the first (and only?) pair of Cornettas built in the United States. No discussion of vintage speakers and their cabinet designs would be complete without mention of the critical plywood selection. Vintage aficionados prefer 3/4" Baltic Birch ply. Do not just go to your local Home Depot and expect to find plywood of appropriate quality. The pair I'm writing about was built from seven-layer Birch with good dense layers throughout. However, even higher quality plies are available. We plan on building another pair using 9-layer Baltic Birch plywood. One shouldn't go overboard though as heavier plywood (i.e. marine variants) can over-deaden the sound. The other improvements to be wrought on our next pair are to spend more time on determining the proper amount and type of enclosure stuffing and install cross-bracing on the back panels (which my friend lazily did not do). Perhaps an eventual update will be in order. The speakers were placed on either side of my fireplace which has recessed L-shaped bookshelves on either side of it. The bookshelves provide excellent diffusion of early reflections. My ears on the listening couch are about eleven feet from the front of the speakers. The center fill and imaging seemed best with the centers of the drivers about seven feet apart. The Red Rose Music 2 Silver Signature amplifier had excess power for the speakers so I switched it into lower-power 17wpc triode. Right off the mark, I was struck by the Cornetta's superb tonal balance. Everything seemed to be in proper proportion, with no frequency peaks or suckouts calling my attention. This is definitely not a bright speaker. The sound is relaxing and easy on the ears while at the same time involving and dynamically exciting. 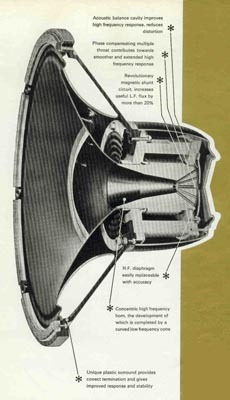 The clarity of Tannoy drivers can be further improved by removing the dust caps that cover the tweeters. Originally designed to protect the tweeters from insects and dust in the studio setting, most serious audiophiles remove this dust cover for home use. Most also upgrade the crossover, at least by replacing the old electrolytic capacitors with modern film types. Hence my listening observations are based on a pair of speakers that are still not as fully optimized as they would be if I owned them. The Cornettas just beg to be put through their paces. Nothing flusters them! They simply thrive on large-scale symphonic works, sailing through my Mercury Opera Highlights CD (Bugs Bunny cartoon music but with great sense of hall space and dynamics) with aplomb. A note about the speakers' imaging would now be in order. Like many hornspeakers -- especially vintage horns -- imaging is not really what they are about. That is not to say that they don't image. They place the vocalists and instruments on the stage in their proper locations, yet they do not carve out the boundaries of the images in the spooky way my Audio Physic Anniversary Steps do and many other modern speaker designs. Depth is also not of the caliber of my Audio Physic Steps which give you the impression that you could walk around behind the speakers and touch the instruments. Put another way, the Cornettas do not fully disappear. While I am greatly enamored of my Audio Physics Step SLEs, I admit to yearning for a weightier sound at times, to wanting to feel sound pressurizing the room. The Tannoys fill this bill and more. The bass on some of the world music from Srajan's 6moons reviewer CDs did shake the floor. These are some great selections, Srajan - thanks! You can also turn these speakers up to very loud levels without incurring any sense of strain or tonal aberrations. Talk about a party speaker! At the same time, you can still talk to the person sitting next to you while they are playing loud. Over the years, I've noticed that some speakers will just pin you to the back of your seat when you turn up the volume. This is probably what many describe as shouty. By illustration, I would point to the speakers that 've owned during the late '80s and early '90s: Nelson-Reed 804s. I suffered through all of the upgrades (804B, 804C, 804CM), installing them myself on the living room floor. These also were speakers that could really play loudly without distorting or compressing, yet they would positively drown out all conversation when cranked up. Electric amps are limited in this respect. However, measurements of the treble output with a McIntosh audio analyzer did not indicate depressed high frequencies. The subjective sense of warmth didn't really bother me or any other listeners that came through my house during this evaluation period. Next, I decided to experiment with the speaker placement to give the reader an idea of their interaction with other room positions. The back of the Cornettas would certainly seem to suggest corner placement, hence I moved my system to the other end of my 28' long room and placed them in the corners firing down the length of the room. The room at that end is 13' wide. One disadvantage of the cornered Cornetta back is that placing them snug into the corners really limits listener distance to remain on-axis. This placement turned out to be surprisingly poor by coupling unduly to the walls and overly exciting my room's resonance modes. Pulling the speakers out by a few feet from both back and side walls and aligning the drivers to fire down the room more brought things back into proper balance. One cautionary note when playing with vintage speaker: If you ever look back at vintage magazines, you will see that speaker placement often took a back seat to room aesthetics and the goal of hiding your speakers as furniture. Just because a vintage design looks like a corner cabinet, don't assume it will sound best that way. During this listening period, I had two occasions during which audiophile friends came by to give the Cornettas a listen. Everyone was very favorably impressed. One friend brought over a pair of prototype tube amplifiers that are in development for commercial sale. These monoblock amplifiers have twin 300B output tubes per channel with unique circuitry, separate grid drive and cathode bias for each output tube. Hopefully, I will write more on these later. The amps produce about 18wpc. Another friend brought over his SE300B amps of more conventional design but with mercury vapor rectifiers. Since the Tannoy 10" Golds are rated at about 92dB and the horn-loading will increase this to at least 95dB (not measured), these speakers seem ideally suited for use with low-power tube amplifiers. However, the vintage circles that I travel in mostly prefer mating the vintage Tannoys to 15-20 watts of power. The SE300B amp drove the speakers reasonably well but the Red Rose and prototype amps both allowed the speakers to open up more and display better dynamics and bass. In this vein, I even noticed that at CES this year, Avantgarde-USA was using relatively high-power BAT tube amps for their German hornspeaker setup. a way of disarming your critical audiophile senses by offering up sheer enjoyment! 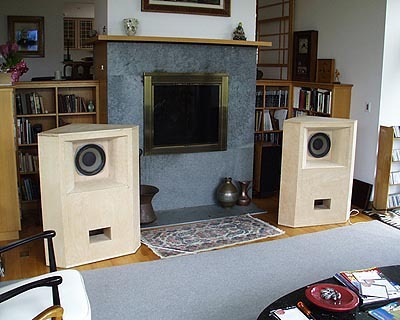 They do rank as one of the very best vintage speakers extant and indeed one of the best speakers I have heard, period.